A few weeks back, I was looking for a cute pair of brown sandals to wear as another option to my previously purchased ones. I like a good neutral shoe with a bit of detail from time to time so when I found these sandals from Rampage at TJMaxx I was smitten. 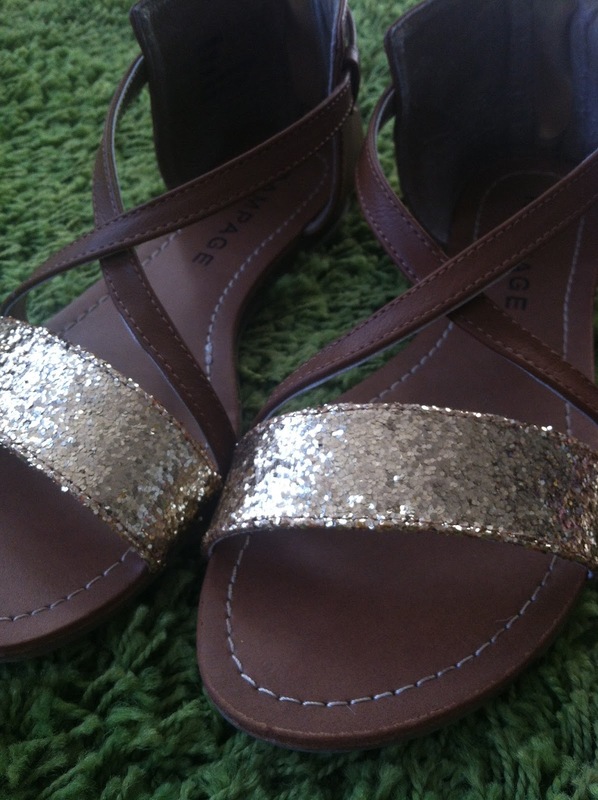 The gold glitter detail along the toes was a cute accessory of shimmer and the cross over straps was complimentary in adding a simple touch to this classic sandal. Shortly after finding the perfect pair of sandals to add to my collection, I found myself in Old Navy looking for some workout clothes. After picking out some tanks and sports bras, I decide to rummage through their clearance section. I love hitting up their clearance section and find they always have a great selection of clothes to buy. From basic shirts to dresses, it's one of my favorite go to spots for goodies! With two shirts and a knit sweater in hand I started for the cash register, but noticed something sparkly on the shelf. 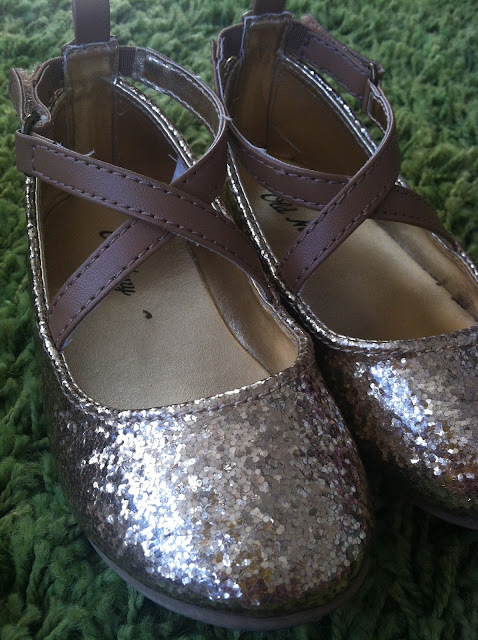 Sitting there were these darling little gold flats that were screaming to go on my daughter's feet. Of course at the price I just had to pick them up. Now believe me when I say this purchase was not intentional. I hadn't even noticed we had similar shoes until we both got dressed one day and were wearing them. The funny thing about it is that these flats are actually her favorite ones. What can I say, she's a fashionista in the making! Love the criss-cross strap details, and OF COURSE the sparkle. super cute scores for both! And at prices that are crazy good!